Hmm think I'll find somewhere a little drier. 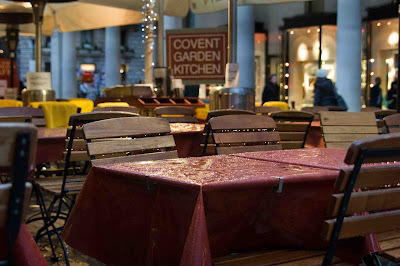 Do they leave the tables and chairs outside all winter? I was there 2 Novembers ago, and ate outside somewhere. When it started to rain, someone came out and put up the awning. It was still nice, because here you wouldn't have that choice in November. Nice composition in this photograph and I like the color! By the way, I added a link on my blog to more info and inside pictures on the house you asked about in your comment on my post today. wait while next week - the snow is coming back! Useless to ask where you took the photo...Beautiful effect with the shops lights in the background. Ciao. A.
I wonder if anyone ever eats outside on evening like this? ... but maybe next time? The place looks nice! I did sat there on a humid evening.Reminds me so much. I'm going to follow your blog cause I feel The London blues and i was once that girl with fresh eyes.Thanks your blog is great and it will allow me to keep an eye on that great town that i'm going to meet again in april after 3 years! hey visit my blog and Rate!